Abuja, Nigeria. August 20th, 2013 – Latest weekly poll results released by NOI Polls reveal that 89% of football-loving Nigerians follow the English Premier Football League, while 51% follow the Nigerian Premier League. This is an 8-point increase from the 81% followership recording in 2012 of the English Premier League, and a 3-point increase from 48% recording of the followership of the Nigerian Premier league in 2012 when NOI Polls conducted its first Football Snap Poll. Findings also reveal that the two largest supported English Premier League Clubs in Nigeria (in terms of fan base) are Chelsea with 37% fans and Manchester United with33%. These are the key findings from the Football Snap Poll conducted in the week of August 12, 2013. Football has always been a hugely popular sport in Nigeria and remains one of the most recognised sports with several Nigerian players playing for foreign clubs. Our presence on the global front further stimulated public interest in international league football. With the kick-off of the English Premier League on 17th August 2013, excitement amongst fans in Nigeria reached fever pitch causing football analysts and players alike to speculate that the race for the 2013/2014 English premiership title is wide open. Clubs involved have put tremendous efforts to improve their chances of winning the title. NOI Polls conducted its latest poll with a focus on the English and Nigerian Premier Football Leagues to explore followership and perceptions about these leagues. This is the second in the Football Snap Poll series traditionally conducted by NOI Polls at the start of the English Premier League Season. Respondents were initially asked a question that served as a screener to determine if they are football fans or not. Respondents that answered negatively had their interviews terminated at this point. Fans were subsequently asked whether they follow the English Premier League and if they do, which clubs they support. This was followed by questions looking to understand why they follow the clubs they do and the duration they have followed their choice club. Finally, in the segment relating to the English Premier League, respondents were asked which club they felt will win the 2013/2014 season. The second part of the poll deals with questions relating to the Nigerian Football League. Respondents were asked whether they follow the NPL, which club they followed and why they follow their club of choice. Additionally, they were asked why they follow the NPL and in the case of those that do not follow the NPL, reasons why. Finally, respondents were asked what they felt can be done to improve the NPL. The second question sought to determine the proportion of football fans that follow the English Premier League:Do you follow the English Premier Football League? Findings show that irrespective of gender, 89% are fans of the English Premier Football league with 90% ofmales and 82% of females claiming to follow the premiership. Further analysis based on geo-political zones shows that the North-West has the highest followership with 92%. Comparing the results obtained from this current poll with those from the 2012 Football Snap Poll reveals that with an 8-point increase in 2013, more Nigerians currently follow the English Premiership than they did in 2012. In response to the question: Which Premier League Club do you support?, we find that Chesea FC is the Premier League Club with the largest fan base claiming 37% of supporters. 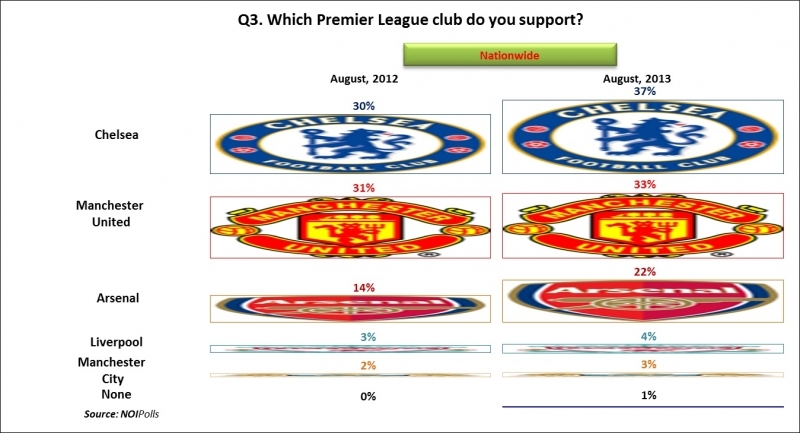 This is followed by 33% that mentioned Manchester United and 22% that indicated Arsenal FC as the clubs they support. With followerships of 4% and 3% respectively, Liverpool and Manchester City Football Clubs command the least number of supporters in Nigeria. Incidentally, a total of 1% of football fans in Nigeria do not presently support any club even though they follow the English Premiership. When comparing club fanbase according to gender, it is interesting to note that more female respondents (41%) support Manchester United than male respondents (32%) and more male respondents (23%) support Arsenal than female respondents (16%). The distribution of supporters across the geo-poilitical zones shows that the highest support for Chealsea comes from the South-East zone with 45%, whilethe South-South accounted for the highest proportion of respondents supporting Manchester United with 39%, and the South-West the highest supporters for Arsenal with 28%. Comparing current results with the poll conducted in 2012 reveals that the fan base for Chelsea FC increased by7-points (from 30% in 2012 to 37% in 2013). The general perception among respondents was that Chelsea is leading the pack due to three main reasons. (1) The return of it's former coach "The Special One" Jose Mourinho. (2) The club has had a successful pre-season and; (3) The signing of new players. In addition, support for Manchester United increased by 2-points from 2012 and support for Arsenal increased by 8-points. Interestingly, with 31%, Manchester United had the largest number of supporters in 2012 while in this current poll Chelsea has the largest number with 37%. In order to gain insight into the reasons why Nigerians support their clubs, respondents who follow the English Premiership were asked: Why do you support your club? Responses show that about one third of supporters(34%) support a particular club as a result of the “good playing style and structure of playing as a team of the club”. This is followed by 32% that support their clubs because “they have the best and strongest players”. In addition 11% support particular clubs “because of a particular player”, while 8% support due to the fact that the “clubs are champions or former champions”. 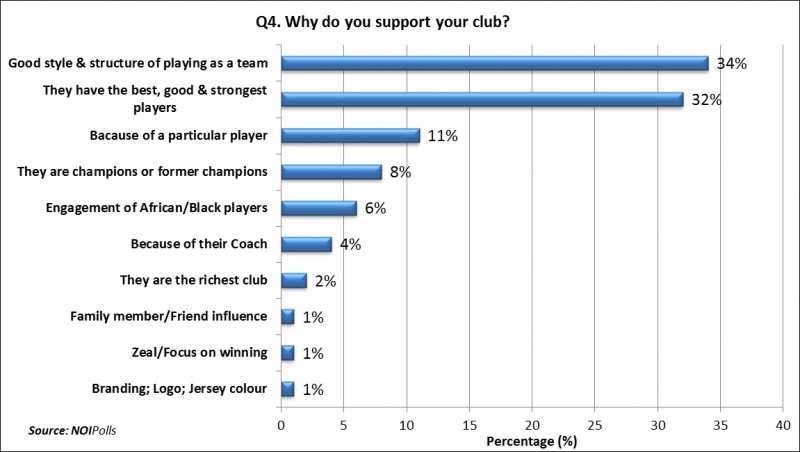 Other reasons why people support particular clubs include, “engagement of African/Black players” indicated by 6% and “Because of their coach” indicated by 4%. In order to determine the loyalty of supporters to their clubs, respondents were asked: For how long have you supported your club? Responses show that 29% have supported their clubs for a period of “Between 4-6 years”, followed by 27% who have supported their clubs for “10 years and above”, while 22% claim their support has lasted “Between 7-10 years”. 40% morefemale respondents have supported their clubs for between 4-6 years than 29% of theirmale counterparts while 29% more male respondents have supported their clubs for 10 years and above compared to8% of female respondents. Assessing the duration of support for clubs by respondents revealed that with 36% of responses,the North-Central zone accounts for the highest proportion of respondents who have supported their clubs for 4-6years. With 36% the North-East and the South-South zones both have the highest number of respondents supporting their clubs for 10 years and above. Comparing the results of the duration of support for clubs in 2012 and 2013 shows a 14-points increase in the proportion of respondents that indicated support for their clubs for 10 years and above (13% in 2012 to 27% in 2013) and a 9-points decrease in the respondents that claim they have supported their clubs for 1-3 years.There is also a 2-points decrease in the proportion that indicated between 7-10 years and a 2-points decrease in the proportion that say they have supported their club for less than a year. The sixth question asked respondents: Which Premiership club would you pick to win the 2013/2014 season that is about to start? Findings reveal that the 40% believe Chelsea FC will win the 2013/2014 seasonfollowed by 35% who think Manchester United, 17% Arsenal and 4% Manchester City. These findings are similar to responses for the football clubs fans support and show that respondents mostly selected the football clubs they support to win the 2013/2014 season. From the geo-political zones standpoint, the North-Central zone accounted for 50% of the respondents who selected Chelsea as the preferred winner of the 2013/2014 season, while with 47% the South-East zone has the highest proportion of respondents wanting Manchester United to be the champions. 25% of respondents from the South-West zone pick Arsenal as the champions for this season. The seventh question sought to measure the proportion of football fans that follow the Nigerian Premier Football League. 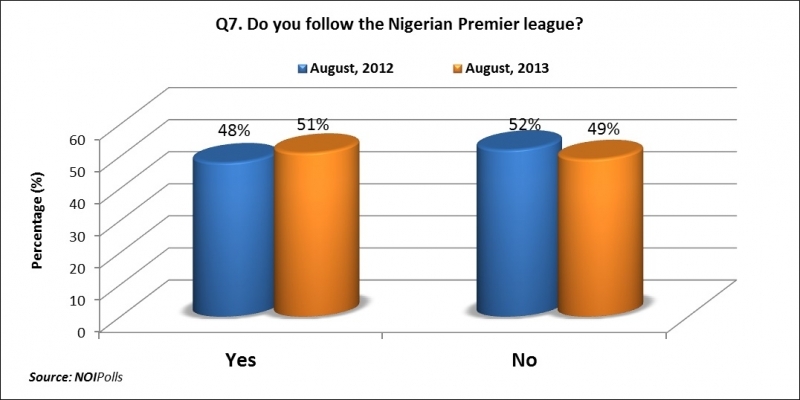 Respondents were asked: Do you follow the Nigerian Premier League? 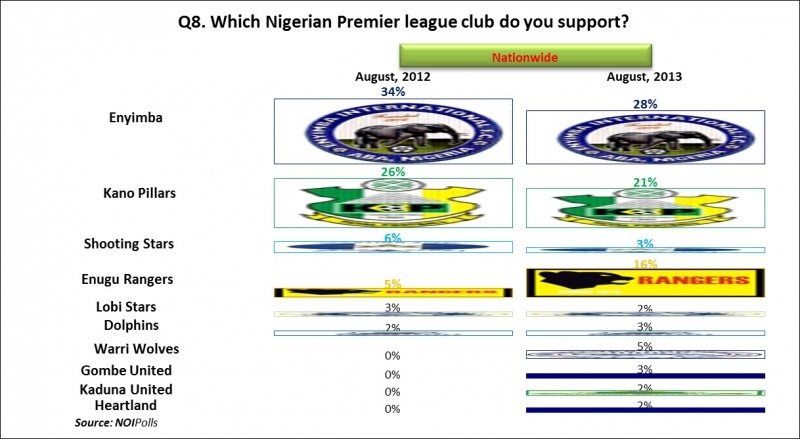 Results show that 51% are fans of the Nigerian Premier League. When compared to the 89% of Nigerians who follow the English Premier league this percentage is low. Furthermore, whilst more males (90%) than females (82%) follow the English Premier Football League, the reverse is the case with the Nigerian Premier Football League with a follow-ship of more females (58%) than males (50%). Assessing followership of the Nigerian Premier Football league from geo-political zones indicates that the South-East zonehas the highest proportion of respondents that follow the Nigerian Premier League with a percentage of 69. When current results are compared with 2012 results, there is a 3-point increase in the proportion of football fans that follow the Nigerian Premier league. Respondents that follow the Nigerian Premier League (51% of the total) were then asked: Which Nigerian Premier League Club do you support? Responses show that the Nigerian Premier League club with the most support with 28% is Enyimba FC, followed by Kano Pillars with 21% and Enugu Rangers with 16%. Other clubs supported include Warri Wolves with 5%, Gombe United, Shooting Stars and Dolphins with 3% each. 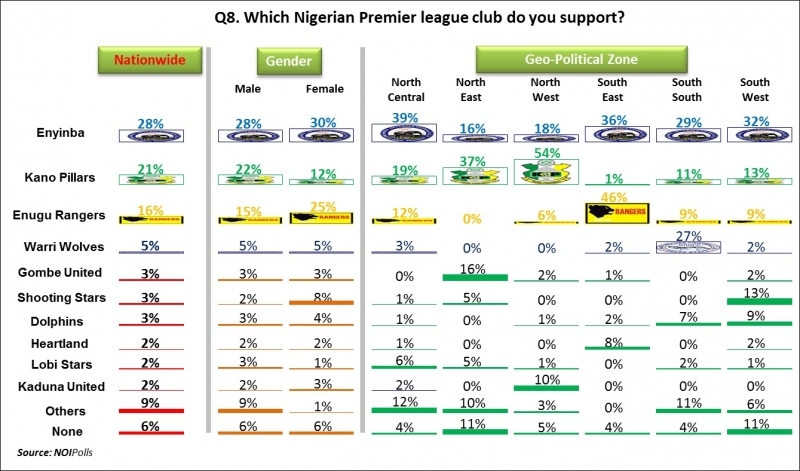 In addition, 6% did not support any clubs even though they follow the Nigerian Premier League. Analysis based on geo-political zones reveals that the highest support of Enyimba FC comes from the North-Central and the South-East zones with 36% each. Also, the North-West zone (54%) has the highest number of respondents with support for Kano Pillars and the South East zone (46%) accounts for the highest proportion of supporters for Enugu Rangers. Comparing current results with the previous poll shows that the fan base for Enyimba has decreased by 6-pointsfrom 34% in 2012 to 28% in 2013. Support for Kano Pillars and Shooting Stars have also decreased by 5-Pointsand 3-points respectively from 2012. On the contrary,Enugu Rangers experienced a considerable 11-pointsincrease in terms of its fan base. Respondents that indicated they follow of the Nigerian Premier League were asked: Why do you follow the Nigerian Premier league? Findings show that 60% follow the Nigerian Premier League “Because it is Nigerian”. Also, 16% mentioned it is “Because of the players” and 12% “Because of the club (indigenous)”. 6% claim they follow because of their “General love for football” while another 6% said “It is the best league in Africa”. In order to gain insight into the reasons why football fans are not interested in the Nigerian Premier League, respondents that indicated they do not follow the Nigerian Premier League (49% of the total) were asked: Why don’t you follow the Nigerian Premier League? Responses show that majority (47%) do not follow the Nigerian Premier League because “It is not interesting”, this is followed by 27% who blame their lack of interest on “Poor playing styles”. 17% claim they do not follow because “Games not shown on TV; low publicity”. Other reasons include“corruption/bias amongst the officials” indicated by 4% and “poor club management; not organised/coordinated” indicated by 3%. Finally, in order to seek the views of respondents on possible ways to improve the Nigerian Premier league, all respondents were asked: In your opinion, what can be done to improve the Nigerian Premier League? 34% suggested “Government’s support for highly improved welfare packages and sponsors” (followed by “Corruption, biasness, tribalism, favouritism in selecting players should be stopped” indicated by 23%. Furthermore, 19% mentioned “Involve good officials and administrators”while 9% each selected “Increase publicity/awareness; show live matches on TV/Satellite” and“Improve the quality of field and stadium facilities”. In conclusion, results from this poll reveal that the English Premier Football League has gained great traction and viewership in Nigeria with 89% followership at the expense of the indigenous Premier League with a fan base of 51%. These results highlight an increase in both Leagues with an 8-point increase in the followership of the English Premier League from 2012 and a 3-point increase in the followership of the Nigerian Premier League. Another interesting discovery is that Nigerians love football irrespective of gender. Findings also reveal that the two largest English Premier League Clubs in Nigeria (in terms of fan base) are Chelsea with 37% of the fan share and Manchester United with 33%. Moreover, 34% have supported their clubs for a period of between 4-7 years. Furthermore, results from the poll show that the two largest Nigerian Premier League clubs (in terms of fan base) are Enyimba FC with 28% and Kano Pillars with 21%. Respondents indict a sense of patriotism by their choice to follow the Nigerian Premier League with 60% following the league “Because it is Nigerian”. Finally, most respondents suggest that “Government’s support for highly improved welfare packages and sponsors” willgreatlyimprove state of the Nigerian Premier League.